If you play night games or games in low light situations, then a light mounted to your primary is crucial. This allows you to keep your AEG or GBB in action while providing illumination into those dark areas where your opponent is hiding. Do I have your attention now? Now that you’re interested, I bet you are looking for a light to fit your gear and style. Well what you see on this page may just be it. The VFC V3X Tactical Illuminator Flashlight is a small light that has everything you’ll need for simple yet effective operation. The unit is easily mounted to 20mm rails and is operational after just adding batteries. Let’s light up the playing field. This light unit has a composite plastic body with a metal bezel. The main body houses the two CR123A batteries, and the back plate that contains the selector switch features a rubber seal and a metal clip to attach it. Its very powerful 200 lumen LED light shines through a glass lens and there is an o-ring at the base of the bezel so the unit is water-resistant. A small switch on the back plate is used to turn it on and off or to the momentary position. When it is in the momentary position, you can attach the momentary switch, or pressure pad, as it’s more commonly known. This pad will only turn the light on while you are holding the button down. 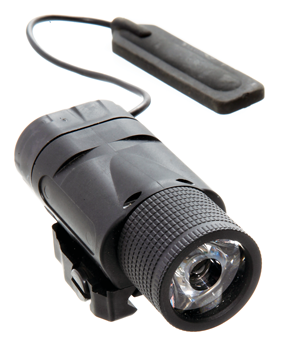 The unit can easily be attached to a rail with its screw-pinch clamp or it can be used as a standard flashlight. A light is a light… right? 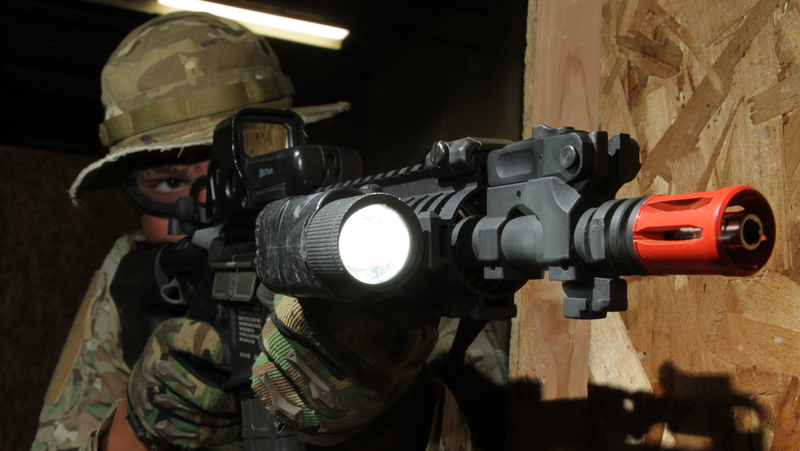 Not at all, because for those nighttime skirmishes, you want a light that will operate effectively and the VFC V3X Tactical Illuminator Flashlight puts out a potent beam. The unit is inexpensive, easy to install and use and can take some abuse; trust me, it went head-to-head with a few walls at the CQB field. Testing a simple light may sound a little odd, but we want to make sure it held up to rough action on the field. I have had the VX3 mounted on my CQB M4 for quite some time. Its small size gives the AEG an overall low profile and it hasn’t snagged on anything. The batteries will last a long time, but then again, the life of the batteries depend on how much the player uses them. I’d suggest finding rechargeable batteries to keep costs down over time. When using the light at night, it shines bright white and allowed me to follow my BB’s to the target. User be warned however, flashlights work both ways and you will certainly give your position away when using one. On the abuse front, this light has been through a lot…doused by rain and knocked up against walls and it still operates perfectly. The connections with the momentary pad are still tight; there is a lot of value in the VX3. PRO TIP: Use 3M brand adhesive Velcro to attach the pressure pad to different positions on your gun. Shoulder the gun and find where you most commonly place your fingers for easy access, then place the pad in that position. I prefer mine between the top and left rail on my AEG. Overall, the VFC V3X Tactical Illuminator Flashlight is on point and gets a five star rating. Although it does take two expensive batteries, rechargeables are available. The small size and optimal power of the light are perfect for the needs of a wide variety of players. Airsoft GI was right when they said we’d be impressed with the function and value of the V3X.